The Adapt Cube Drafting chair features a mid size square back, comfortable soft moulded High Density foam seat and a 3 lever independent Tilt mechanism. Fitted with counter height Drafting lift and Alloy footring. Made in Australia the Adapt Cube is a fully adjustable task chair designed with greater ergonomic principles and adjustability. 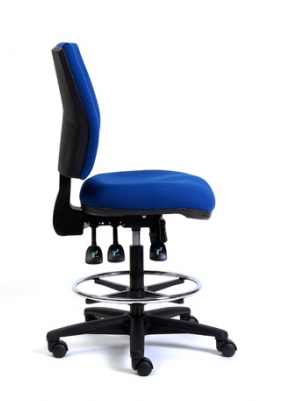 The Adapt Cube’s unique mechanism design allows users to easily adjust the seat and back angle as well seat and back height while the soft density foam seat pad encourages correct sitting posture. The modern square back of the Adapt Cube drafting is made of 80% recyclable materials and is manufactured to Australian standards.